Compare MT4 to c-Trader is not consistent! MT4 can only be compared to a platform launched in the 2005 period, and Metatrader 5 with a platform launched in the 2010 period. Do you think mql5 is better than mql4? I am speaking about languages not about platform. With NT you don't need 400 lines of "spaghetti code" to trade an indicator. Juan was speaking about diagnostics, 3 or 4 year ago it is clear that the demand for diagnostics on cTrader trackrecords was minimal compared to mt4. It is not the same thing as cTrader vs mt5 as a successor for mt4 today. Yep, so far I prefer MT5 to MT4. I taught C programming in the 80's and was very surprised to see that the MT4 version of C left out so many good tools as designed by K&R.. To me, MT5 (C++ based) is definitely an improvement. I think that following the C++ conventions, ie. more lines of code to be written, more control is left up to the programmer. This is good for those developing more complex AI/NN autotraders but definitely clumsy for simple systems/users who generally develop "spaghetti code". Unfortunately, most traders do not come to this industry as professional coders, hence the frustration and dislike of MT4/5 ... IMO of course. That being said, we don't "have" to use all their code, instead, only write what we need to do the job. Trade management with objects and classes is not so bad. 10 lines to use an indicator instead of one line, with no practical advantages. A trading platform has to satisfy the needs of professional traders, not professional coders. Professional traders use Multicharts, with its simple easylanguage, so that traders can concentrate on the logic and on parametrization method, which make that difference to beat the market. Beating the market is the goal not saving ram or showing your coding skills. 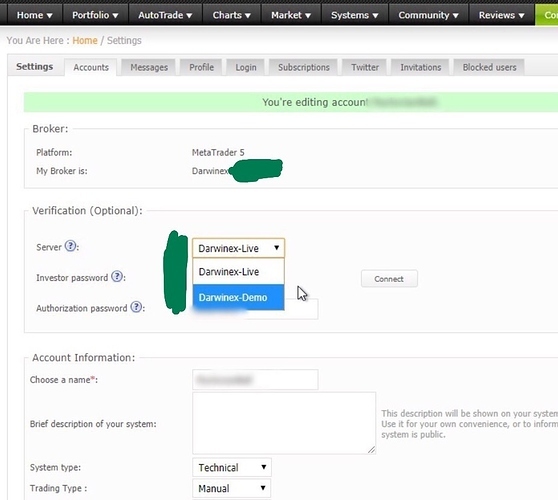 The MyFxBook EA does not detect Darwinex as a MT5 broker + servers yet. Everyone knows that new software is more efficient than old software. Another joy for automated traders using a VPS. At least it is consistent with the increased lines required by mql5 code. just to be fair that is nothing totally unusual as RAM has becoming cheaper over the years and keeping more components in memory improves performance by a great deal. That's why newer windows versions also consume more RAM than previous versions. In the last webinar, Juan testified that MT4 was limited to put into perspective the potential of Darwinex. It is an outdated solution that is lacking versatility technology wise. He expressed it notably about the missing order types that were slowing down the growth of Darwins’ absorption. I am not sure if you guyz (incl. @DarwinexLabs) are aware of the "StereoTrader" for MT4 - and the functionality that comes with it: You can i.e. do partial closes and all the good stuff. Trade Forex and CFD's similar like you can trade Futures, functionality-wise. Some Brokers do co-operate with the developer of the "StereoTrader" - maybe that would be an option for Darwinex as well? It’s looking like a really nice and practical layer interface, with guenine benefits. That’s also part of the problem that was expressed. It was meant not to mimic functionnalities platform wise only. But have the nature of the transmission respected in terms of order types forwarded to face the LPs. Fill Or Kill orders with a volume feedback. True limit orders that are placed within the order book. StereoTrader talks about “synthetic” MIT orders for a reason. They still don’t get last trade, so they derive from bid/ask prices in an attempt to win the spread by early entry. The trigger is not the real deal. Not that it’s particularly better or worse, just different. Another quest of order type would be volume weighted orders to trigger only when a given quantity trades to pierce throuh a level. I'd like to ask if the provided history (bar and tickdata) is actual darwinex history or delivered by metaquotes? Current tick history is not from Darwinex, but from another quality source. Please, be careful about using it for backtests, as you know, stored history can show tick gaps and any other possible errors. I cannot give you more information about this question. I am starting to experiment and optimize some new strategies using mt5 tester. For example the new tester doesn't allow to set a custom spread, from what I found spread is recorded on the provided history. On mt4 I was working with stadard m1 data provided by metaquotes. IMO it is important to know the origin and the spread of this default data we have on Darwinex's mt5. Is the spread calculated on-the-fly using ASK-BID? In mt5 every bar has its own spread. what is the purpose of showing "spread" of a M1 bar? Is the average spread in that bar? This is too much for me, my experience with mt5 is only one week. Let's wait for true programmers or automated scalpers or Darwinex guys. After a couple of weeks I have to admit that dealing with mt5 and mql5 is not so tragic. What is evident is that mql5 has been designed more for programmers than for traders. Programmers that build their library of classes and objects, after that they can automate every kind of strategy in a short time and sell it to the trader that is ready to invest time and money on a trading idea.